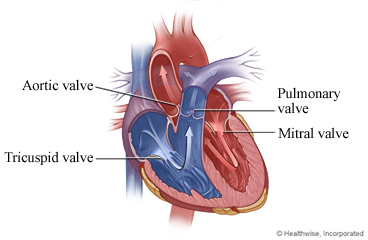 Heart valve surgery fixes or replaces a damaged heart valve. Your doctor did the surgery through a cut, called an incision, in your chest. You will feel tired and sore for the first few weeks after surgery. You may have some brief, sharp pains on either side of your chest. Your chest, shoulders, and upper back may ache. The incision in your chest may be sore or swollen. These symptoms usually get better after 4 to 6 weeks. You will probably be able to do many of your usual activities after 4 to 6 weeks. At first you may notice that you get tired easily and need to rest often. It may take 1 to 2 months to get your energy back. Some people find that they are more emotional after this surgery. You may cry easily or show emotion in ways that are unusual for you. This is common and may last for up to a year. Some people get depressed after this surgery. Talk with your doctor if you have sadness that continues or you are concerned about how you are feeling. Treatment and other support can help you feel better. After surgery you may need to take a medicine (called a blood thinner) that prevents blood clots. If your doctor prescribes a blood thinner, it is very important to take the medicine exactly as directed. Be sure to tell all your doctors and your dentist that you have had heart valve surgery. This is important, because you may need to take antibiotics before certain procedures to prevent infection. Even though the surgery fixed your heart valve, it is still important to eat a heart-healthy diet, get regular exercise, not smoke, take your heart medicines, and reduce stress. Your doctor may recommend that you work with a nurse, a dietitian, and a physiotherapist to make these changes. This is sometimes called cardiac rehabilitation. Rest when you feel tired. Getting enough sleep will help you recover. Try to sleep on your back while your breastbone (sternum) heals. This usually takes about 4 to 6 weeks. Try to walk each day. Start by walking a little more than you did the day before. Bit by bit, increase the amount you walk. Walking boosts blood flow and helps prevent pneumonia and constipation. For at least 6 weeks, avoid lifting anything that would make you strain. This may include heavy grocery bags and milk containers, a heavy briefcase or backpack, cat litter or dog food bags, a vacuum cleaner, or a child. You will probably need to take 4 to 12 weeks off from work. It depends on the type of work you do and how you feel. Do not swim or use a hot tub for at least 1 month, or until your doctor says it is okay. Eat a heart-healthy, low-salt diet. If you have not been eating this way, talk to your doctor. You also may want to talk to a dietitian. A dietitian can help you plan meals and learn about healthy foods. Take your medicines exactly as prescribed. Call your doctor or nurse call line if you think you are having a problem with your medicine. If you take aspirin or some other blood thinner, be sure to talk to your doctor. He or she will tell you if and when to start taking those medicines again. Make sure that you understand exactly what your doctor wants you to do. Be safe with medicines. Take pain medicines exactly as directed. If you have strips of tape on the incision the doctor made, leave the tape on for a week or until it falls off. Wash the area daily with warm, soapy water and pat it dry. Don't use hydrogen peroxide or alcohol, which can slow healing. You may cover the area with a gauze bandage if it weeps or rubs against clothing. Change the bandage every day. Do not use any creams, lotions, powders, ointments, or oils unless your doctor tells you it is okay. Keep track of your weight. Weigh yourself every day at the same time of day, on the same scale, in the same amount of clothing. A sudden increase in weight can be a sign of a problem with your heart. Tell your doctor if you suddenly gain weight, such as 1.3 kilograms or more in 2 to 3 days. You have severe pain in your leg, or it becomes cold, pale, blue, tingly, or numb. You have loose stitches, or your incisions come open. You are bleeding a lot from the incisions. You are sick to your stomach or cannot keep fluids down. Enter E886 in the search box to learn more about "Heart Valve Surgery: What to Expect at Home".